My wife Judy is helping me write this stuff about myself for your list. My guys would know me as: Mike (Hippie) Sperou. I was in the third platoon with Milton and Plantz. We had Lt. Teasley of 3rd platoon when I was there. I am sure he remembers those ambushes. You guys left out Wayne Taylor and Steve Heyer. I was WIA 15th march '69. 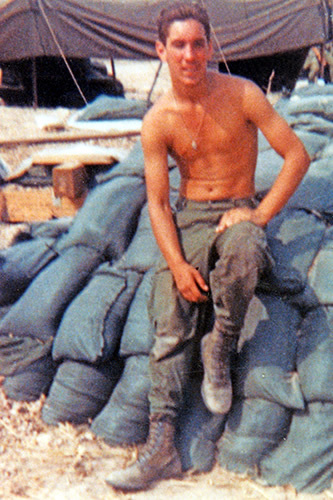 I was in the field Jan '69 through Sept '69. We have a few pictures and will send them to you soon. Thank You for doing all this work, it was really wonderful to look it over. It got me in a time warp. Note: Click here to see a copy of the "Daily Officers Log" for 15 Mar 69. Jack "The Man" (?) in the back. (The guys in my platoon will know). Hippie (Mike Sperou) in the center. I cannot remember the name of the guy in the front. 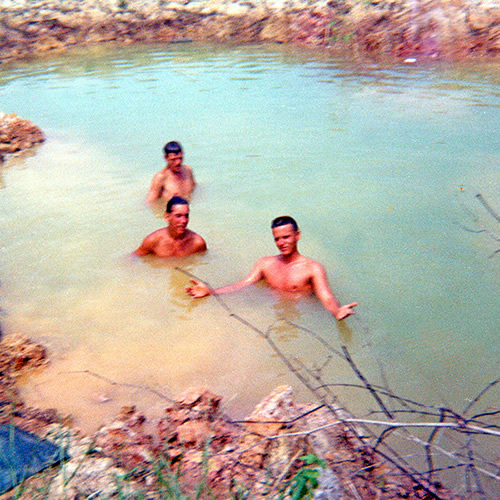 This is in a bomb crater in the field off LZ White. Mike "Hippie" Sperou LZ White. January '69. Mike "Hippie" Sperou: LZ Rock. Late September, early October '69. 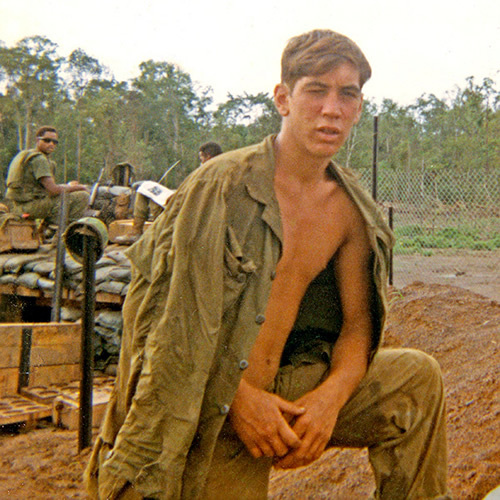 This is what nine months in the 'Nam will do to you.